DO YOU WANT TO BE THE NEXT ORGANISER OF LA PAILLOTE TAKPEKPE? Alliance Française Accra is looking for directors for La Paillote Takpekpe. La Paillote Takpekpe is an event that takes place on the last Friday of each month at Alliance Française on the stage facing the restaurant La Paillotte. The opportunity is given to an artist to organize an innovative show within Alliance Française premises. This multidisciplinary event is a platform for projects being developed and emerging artists. 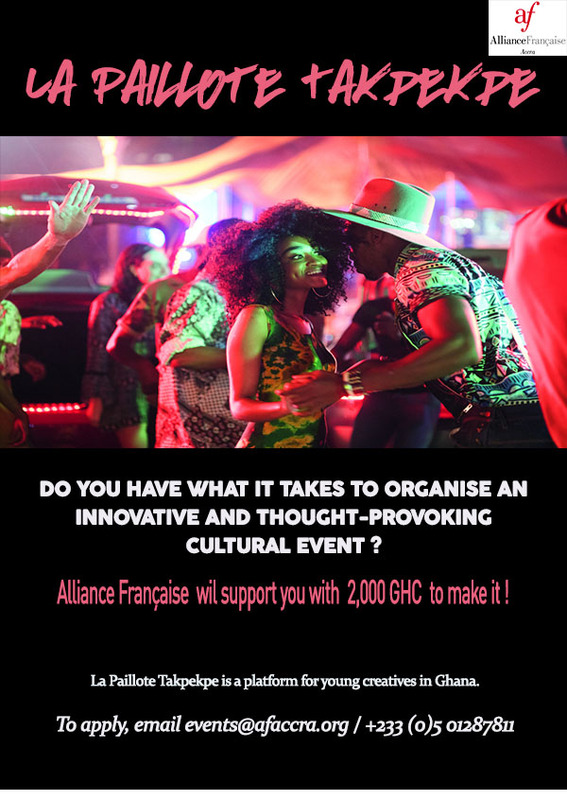 The organizer or “director” has a budget of 2,000 GHC (including 300 GHC dedicated to the communications) and is supported and advised by the cultural team of Alliance Française Accra. The organizer has to present a project, which must above all be creative and innovative, and should not be confined to a single art field. Music, dance, theatre and many other art forms can mingle and be part of the project. La Paillote Takpekpe should be multi-disciplinary! For this event, the director can make use of the small stage but can also use the lawns, the terrace, involve the restaurant and have access to the exhibition hall if needed. This event is also a way to support Ghanaian artists and expand access of disadvantaged audiences to arts and culture. Alliance Française Accra provides a rehearsal space, the necessary equipment (sound and light), technicians, and its expertise in logistics and communication of the event. If you want to propose a project for La Paillote Takpekpe, please complete and return the attached document.